It's less than obvious from this post's subject line, but I can still type. Gw'oth (singular, Gw'o) are starfish-like aliens that figure in the Fleet of Worlds series of novels. Jotoki (singular, Jotok) are starfish-like aliens that figure in the Man-Kzin War series of books. 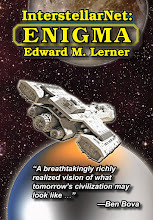 The FOW novels are my space-operatic collaborations with Larry Niven. 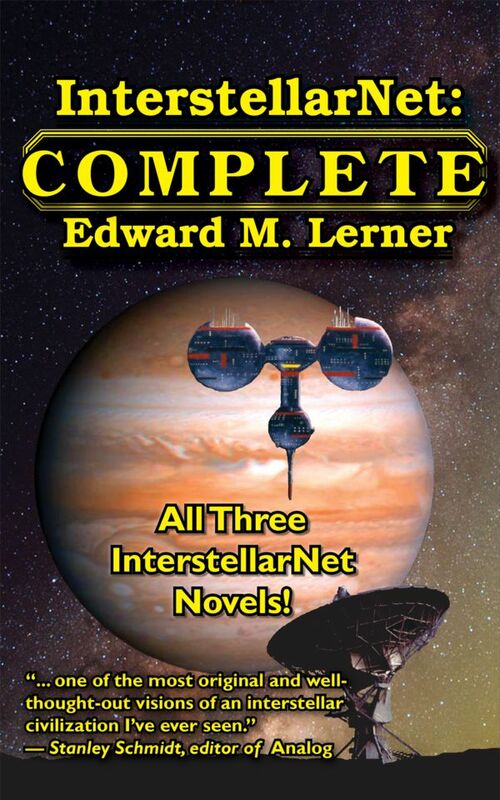 The MKW books are short-fiction space-operatic collections "created by Larry Niven," with most stories contributed by other authors. Both series share a setting Larry calls Known Space. But that's a very spacious (pun unavoidable) setting: call it a thousand years of future history in a steadily growing volume that is many light-years across. Plenty of room therein for storytelling ... MKW and FOW do not meet. Humanoid aliens teem in SF, with seldom any speculation that the species are related even when the humanoids share a fictional universe. No such forbearance for starfishoid aliens. Speculation abounds, as in this Wikipedia article about Known Space, that Gw'oth and Jotoki are related. Perhaps the best way to show that Gw'oth are unrelated to Jotoki is to highlight some differences. Jotoki: They begin life as independent eellike aquatic creatures swimming in fresh-water lakes. As adults they form air-breathing five-member colony creatures. Each "eel tail" (as one story describes a Jotok) is four feet long. Jotoki live on Earthlike planets. Gw'oth: A Gw'o begins life as a five-limbed being -- and (being intentionally vague, to avoid spoilers) -- some Gw'oth can temporarily link into higher-order groupings. Gw'oth are aquatic throughout their lifecycle and live in the salt-water ocean beneath the ice of an airless moon much like Europa. An adult Gw'o is described in one book as "no bigger from tip to tip than the length of your arm." 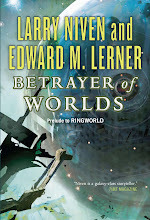 I am only now reading Betrayer of Worlds (read Destroyer of Worlds last week). I love the Gwo'th and find myself rooting for them in all their travails. However, one question. Back in college days, we used to speculate about different alien civilizations, and tried to come up with one living on an ice moon. Had fun until one day my friend said Wait a Minute! They can't make fire. How are they going to create a civilization? We subsided in depression and agreed the poor creatures were sunk. So how did these Gwo'th create fire? Thanks for your kind note. I'm quite fond myself of the Gw'oth. Ah, fire. It does seem essential to control fire to get to any kind of significant non-biological tech. We dealt with that detail earlier in the series. They could not have had ... any type of electronics, until after they went above the ice. Their only prior experience with gases would have been from undersea volcanic eruptions, or vacuum boiling of the water in a fresh ice fracture. Look at them now: We've got video of them wearing their pressure suits inside their above-ice buildings so that they can contain an atmosphere. Why? They need fire! Fire for what they still see as new industrial processes. Fire was unnatural, chaotic, and transformative. Fire was fearsome. Early in the great breakout above the ice, fires had killed and hideously maimed many. As Er'o, he had never experienced a wildfire, but a mountaintop foundry consumed by flames was etched deep into Ol't'ro's memory. The Gw'otesht had lost two members to that terrible conflagration. Two dead! That accident had almost extinguished Ol't'ro themselves, long before Er'o's birth. Early pressure suits had been only garments made from the tough hide of deep-sea creatures, trailing hoses to leather-bag "pumps" kneaded by helpers who remained beneath the ice. The igloo is then filled with gases from (e.g.) chemical reactions or as produced by the Jm'ho equivalent to cyanobacteria. Once the Gw'oth have primitive electrotech -- and galvanic cells are pretty simple to make -- the Gw'oth could also electrolyze water to produce oxygen. What do they burn in their oh-two? How about hydrogen sulfide captured from the undersea vents? Or they may mine flamable minerals (like sulfur) from the seabottom. And, of course, much of the ocean floor (on Earth, anyway) is covered in flamable methane clathrates. FWIW, I find Gw'oth mastering fire easier to envision than cowardly Puppeteers doing so. Picture a primitive Puppeteer encountering a wildfire and reaching for a burning branch -- with his face. That's what he must do, because his mouth serves as a hand, and the head also has an eye and an ear. Hmm, I have Fleet of Worlds already. I remember that scene. Man, the Gw'oth have quite a hump to get over. So being smart is essential (to scare the crap out of the annoying Puppeteers, too). As for the fearful Puppeteers, it seems that THEIR advances would all come at the hands (mouths?) of insane entities, coupled with their native high intelligence. Thanks for the response. A number of people have tried their hand at Niven's universe and I like your interpretations the most.